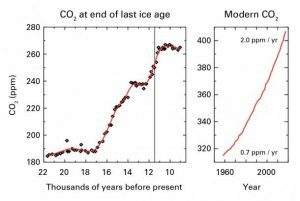 The World Meteorological Organisation (WMO) has recently reported that concentrations of CO2 gas (a major greenhouse gas contributor to global warming) had surged in 2016 to reach a level not seen for more than 3 million years..
More alarmingly is that the abrupt rate of increase in concentration of the gas in the atmosphere is unprecedented. Rapidly increasing atmospheric levels of CO2 and other greenhouse gases have the potential to initiate unprecedented changes in climate systems, leading to “severe ecological and economic disruptions,” said the report. Population growth, intensified agricultural practices, increases in land use and deforestation, industrialization and associated energy use from fossil fuel sources have all contributed to the increase. “Without rapid cuts in CO2 and other greenhouse gas emissions, we will be heading for dangerous temperature increases by the end of this century, well above the target set by the Paris climate change agreement,” said WMO Secretary-General Petteri Taalas. “Future generations will inherit a much more inhospitable planet, “ he said. In the same week that the WMO issued its bulletin, the ‘Lancet’ one of the world’s oldest and most respected medical journals, published the findings from a multi-disciplinary research project on Health and Climate Change which revealed that health of hundreds of millions of people around the world is already being damaged by climate change. Some of the factors noted included a huge increase in the number of people over 65 exposed to extreme heat which rose by 125 million between 2000 and 2016, increased spread of dengue fever due to an increase in the rate of breeding of mosquitoes and the virus they carry, millions of deaths each year attributed to air pollution, including 800,000 annual deaths related to the burning of coal and crop loss due to increasingly hot and extreme weather which would result in malnourishment, particularly of children. The report reiterated that climate change was the biggest danger to global health in the 21st century.